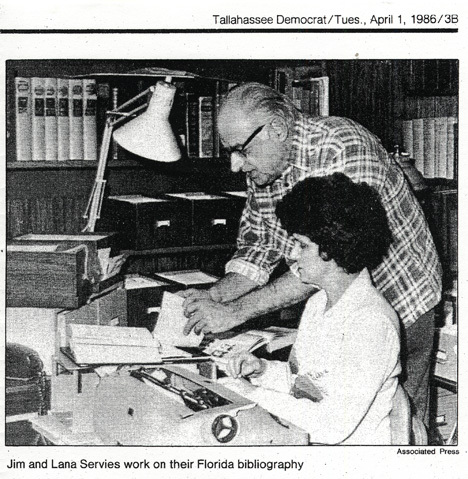 Jim and Lana Servies at work early in their research for the Bibliography of Florida. Mao Tse Tung said that every journey begins with a single step. For James Servies, who in the midst of his library career took on the construction of two important bibliographies, there have been two long journeys and thousands of entries that ensure that both his bibliographical projects and his name will resonate with scholars, book dealers and collectors long into the future. These projects are the Bibliography of West Florida and the Bibliography of Florida. "Few regions of the United States of America have suffered more from scholarly neglect than that portion of the Gulf Coast between Mississippi and the Apalachicola rivers which we here call West Florida." In creating his bibliography he set out to correct that neglect. Today this bibliography is somewhat dated. Its last amendments were printed in 1982. As is to be expected there are very few copies left. Jim and his wife Lana have four sets of the 4 volumes, each set priced at $250, a required item for any dealer or collector whose field embraces the 1760s British definition of West Florida. For many people one very serious bibliography would be their lasting achievement. For James Servies and his wife, it was the warm-up. Beginning again, in the mid 1980s he started work on his Bibliography of Florida, a bibliographically more complete work that is focused on Florida as the term has been defined through time.